Scotland centre Matt Scott admitted to being relieved to find out he was included in the final 31-man squad for the World Cup. Edinburgh back Scott, 25, missed the final four months of last season through injury and had an operation on a persistent shoulder problem. "Excited, proud, loads of emotions on Sunday when I got the call," he said. "You are just never quite sure if you have made it or not so it is such a relief to get the call." And he added: "I hadn't played since the Six Nations and I felt I didn't really do myself justice in the Six Nations at all so I knew there was time pressure in the sense that I needed to train well and play well." Scott has sympathy for those players who have missed out on being picked for the World Cup but has the utmost faith in head coach Vern Cotter and all he is trying to achieve with the squad. "Vern is a guy who is a great coach and who works with us every day," Scott told BBC Scotland. "He goes through training with a fine tooth comb. He's got a plan for us going to the World Cup. There is going to be disappointed guys and it's a shame to see a lot of guys leave camp. "We are right behind the way Vern wants us to play. We are right behind his vision for us and if he thinks this 31 players is the right balance then I am completely behind him in that sense." Scott believes Saturday's final warm-up match against France in Paris is the perfect way to take the focus away from who has made the squad. "To bring us back down to earth we have a really tough Test match this week," he explained. "It's a really tough place to go and we have not won there since 1999 so that has really sharpened our focus. "The morning of the announcement we were in training doing analysis so we didn't really have much time to dwell on the impact of the selection. "[The French media] are expecting France to put in a good result on us. For me it will be a great indicator of where we are in terms of our development and how far we have come over the past couple of months." 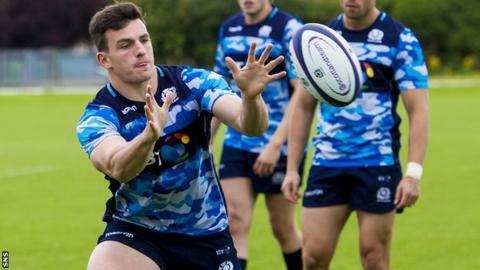 Scott has been involved in Scotland touring squads and build-ups to the Six Nations but revealed the preparation for the World Cup has been "eye-opening". "It is just so much more intense," he added. "Having the unique situation of having two months together, there has been no stone left unturned. Vern's attention to detail is so impressive. "I feel I will come out the end of it a different player and a different person in a positive sense."